Colorado medical license profile for Christie Lee Engel, MD. Tennessee medical license profile for Christie Lee Engel, MD. Listings for Christie Engel at Planned Parenthood abortion clinics in Ft. Collins, Aurora, Denver, and Colorado Springs, CO. Listing for Christie Engel, MD, at Denver Planned Parenthood abortion clinic. Listings for Christie Engel, MD, at Planned Parenthood abortion clinics in Denver and Ft. Collins, CO. Listing for Christie Engel at Planned Parenthood office in Denver, CO (not an abortion clinic). NPI number info for Christie Lee Engel, MD. 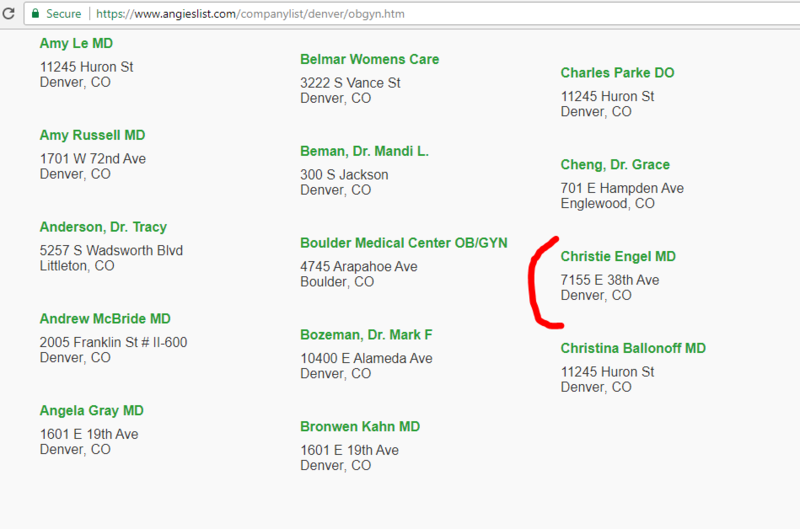 Listing for Christie Engel at Planned Parenthood abortion clinic in Denver, CO. See page 2.